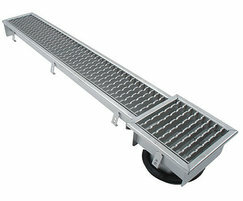 BLÜCHER Type 671 is a channel drain with an outlet box for concrete, in-situ or tiled floors. 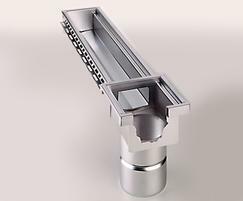 BLÜCHER Type 671 are thin-walled drain channels, made from TIG-welded and acid-pickled stainless steel ( grade AISI 304 or AISI 316L). Channels for concrete or concrete tiled floors have a wall thickness of 2mm, and channels for flexible sheet flooring have a wall thickness of 1.5mm. Channels with a length in excess of 2000mm are fitted with cross bars which stabilize the channel and safeguard it against being deformed during casting. Cross bars also prevent the gratings from dislocating along the length of the channel. In channels with an internal width of 77mm and in slot channels, the longitudinal fall is 0.5-0.6%, in other channels 1%. The cross fall corresponds to 130° for slot channels and 150°-170° for other types of channels. They can also be ordered at any length and with as many outlets / corners / tees in them as desired by the customer. The difference between the channels is the profile. 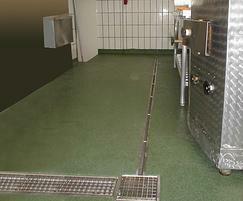 The Type 672 BLÜCHER Channel is a channel drain without an outlet box. 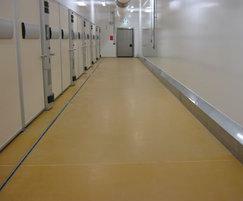 It is designed for use with sheet vinyl floor covering. 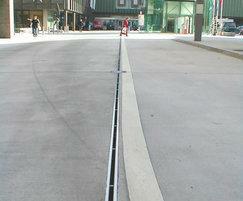 BLÜCHER channel are thin-walled drain channels, made TIG-welded and acid-pickled stainless steel.